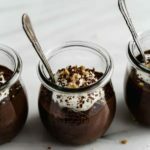 This mousse is made with chia seeds and coconut milk for a creamy and delicious dessert! Melt the dark chocolate using a double boiler method or in the microwave. Add the chia pudding mixture and mix together. Add the chia mixture to a high-speed blender with the rest of the ingredients and blend until smooth and creamy. Transfer the mousse into small cups and place in the fridge to firm up, for at least an hour or overnight.